At Redesmere Sailing Club there is something for everyone, including a large fleet of Club Boats available to Members free of charge; Social Sailing for those who wish to potter, practice or pop down for a drink; Racing for all levels of ability, from novices to extremely experienced and providing varying degrees of competition for all; Training and support for those who simply wish to improve their skills and/or experience; Standup Paddleboarding (SUP), Radio Controlled (RC) sailing and other opportunities for non-sailors to support their friends' and family's sailing. Most importantly, a culture of informal support and encouragement is built into the Club's DNA and anyone at the Club can be sure of a willing helping hand or guidance from other Members - on or off the water. Club Boats and Buoyancy Aids are available to Members throughout the year, free of charge, with no pre-booking required - simply turn-up and play. All we ask is that Club Boats are treated with respect and that if any accidental damage or breakage does occur it is reported promptly, so that repairs can be carried out before the next sailing session. The Club has ample car parking, although number of Members take the opportunity to run, cycle or walk to the Club through the surrounding beautiful Cheshire countryside. The Club has an action packed calendar with a number of social events ensuring members enjoy their time both on and off the water, this year's calendar includes; fun day, camping sleepover, charity participation in Bart's Bash, team-relay event (with random forfeits for added 'fun'), Halloween Social Sail and Christmas party. 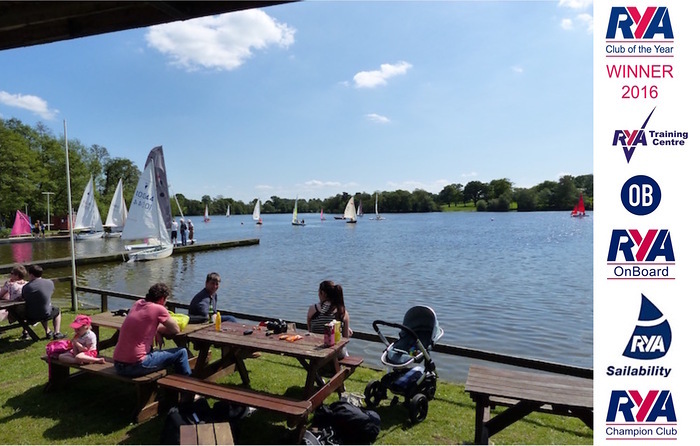 In 2016, Redesmere was named 'Club of the Year' by the RYA, recognising amongst other things our vibrant membership, broad range of sailing and development opportunities and our commitment to ongoing development. As part of the Club's 60th Anniversary Celbrations in 2017, the Club hosted HRH The Princess Royal (President of the RYA) who not only went out on the lake with Members but also took the opportunity to meet a wide range of Members and to present a number of RYA Training Certificates. In 2018 the Club committed to investing in a new modern fleet of double and single-handed Club Boats and, in 2019, continues to go from strength to strength, with a diverse and enthusiastic membership, as we continue to develop and grow for the future. If you would like to know more about the Club, or might be interested in Joining Us, please feel free to call down or simply Contact Us and someone from the Club will get back to you. Similarly, if you are interested in sailing, but not sure if it is for you, please pop-down to one of our Saturday Social Sails and we should be able to arrange a Taster Sail for you; alternatively, Contact Us and we'll arrange to meet you at one of our regular events for a Taster Sail.